One Friday in April, at 5:30 a.m., Kim Demars got a phone call from a horse. 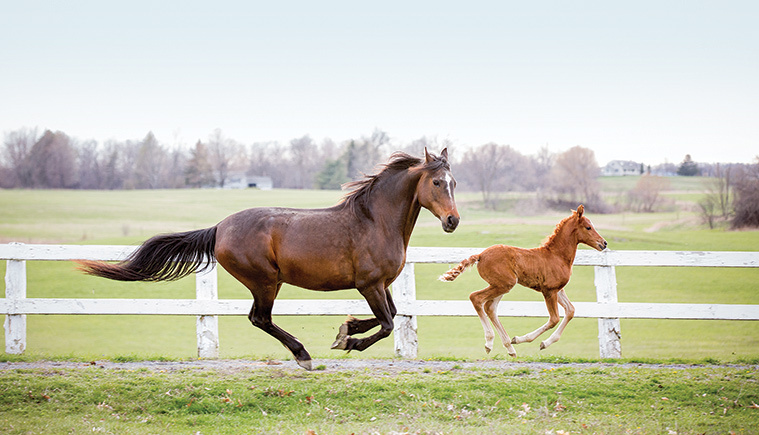 A sensor attached to the mare triggered the call, a “foal alert,” signaling that the mare had gone into labor. The team assembled at the barn; soon after, the foal arrived, long-legged and healthy at more than 100 pounds. This new addition has old roots, a descendent of the first horses bred on the same land 140 years ago. Set on a winding road in Weybridge, the UVM Morgan Horse Farm’s 215 acres unfold as a mix of rolling pastures and woods. The focal point: a commanding Victorian-style barn, just behind a towering bronze of the first Morgan horse. Looking at the sculpture, it’s obvious that the Morgans of the early twentieth century were stocky and strong. That, explains farm operations coordinator Margot Smithson, was by design. “They were true workhorses,” she says, and would do any job. Plus, muses Smithson, “Vermonters are thrifty and always have been,” making this tractable, do-everything breed a natural fit for the rugged Green Mountain State. And while today’s Morgans appear different, more svelte and “refined,” their bloodline is strong; this is believed to be the oldest continuous Morgan horse breeding program in the world. The Morgan is Vermont’s state animal, but the influence of the breed extends far beyond state lines. “Morgans were the horses that Americans used to move west,” says Ronda Moore ’72, DVM, chair of the farm’s board. Morgans were long the preferred mount of the military; legendary generals Phillip Sheridan, Stonewall Jackson, and George Armstrong Custer rode them. “They took soldiers into battle up until World War I. They were a troop carrier, not unlike the Jeeps, Humvees, and tanks of today, Morgans are their flesh and blood counterpart. And this is the place where the parts were made,” Moore says. So, just how did these animals come to be in Weybridge? Those familiar with Vermont history might recognize the name Colonel Joseph Battell (he was a legislator and helped preserve the land that would eventually become Camel’s Hump State Park). 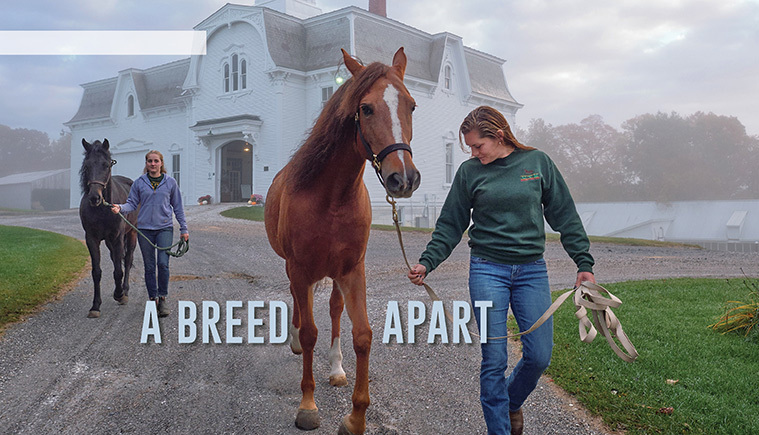 In 1878, Battell built the barn to house and breed his Morgans; in 1906, Battell gave it all to the government, a move many credit with saving the breed. The USDA operated the farm until 1951, establishing what’s today called the “government line” of Morgans for cavalry use and research. In the 1950s, the USDA gave twenty-five horses, and the property, to UVM (the other horses went to fellow land-grant universities, including UMass and UConn, which still have Morgan programs). Battell’s horses are the ancestors of the thirty-two or so strolling the farm today. It’s a common refrain among the staff that the farm is home to spirits, or “ghosts,” depending who you ask. “This place, you feel it when you walk around the grounds, there’s living history,” says Smithson. The skeleton of a stallion, Black Hawk, on display in the visitor’s center, also helps. Today, the farm is poised to enter a new chapter under new leadership. It’s the first time the farm has a woman at its helm; Kim Demars was named farm manager in 2017, when longtime director Steve Davis ’72 retired. Demars, who grew up in Addison County on a dairy farm, remembers visiting the Morgan Horse Farm when she was ten years old. Smithson has been at the farm the longest, four years, and is now focused on building a strategic plan for the future. “The trifecta of women is something you don’t see on farms very often,” says Demars. But she’s quick to note that this is not a typical farm; it’s also a tourist attraction, and a place of higher education. “We’re an anomaly in that sense,” says Demars, so though the three women work in very different roles, they’re all focused on the same goals. One clear opportunity for the future: “This could be UVM’s Addison County campus,” says Steph Dion ’00, assistant dean in the College of Agriculture and Life Sciences. Dion has worked to build links between Burlington and Weybridge, helping to bring administration and faculty down to the farm to experience it in person. Already, it’s opened doors to funds for badly needed infrastructure improvements, like new pasture fencing. President Sullivan and his wife, Leslie Black Sullivan ’77, have become frequent visitors, and have even named a foal, UVM Zealous Advocate. “Some of the experiences I remember as an undergrad are what I’d love to see happen here,” says animal science chair Dave Townson. Townson, who came to UVM from the University of New Hampshire in 2016, knows these hands-on experiences are vital for landing jobs post-graduation. In addition to classes and clinics that serve animal science majors, the team envisions reaching a broader cross-section of students in disciplines such as community development or communications. As they chart the future, Townson is confident he has the right team to take the farm forward. The Morgan Horse Farm is open for visitors every day May-October, 9 a.m.- 4 p.m. Guided tours are offered every hour, on the hour. Special events include the annual Vermont Day open house, August 4, and the Day of the Morgan, October 27, when a foal is raffled off.